Love crustaceans? Crab, lobster, prawn, yabbies... I love them all but I usually prefer to eat them at home as I cannot help but use hands and fingers to enjoy them to the max. I'm delighted to be at Crab Factory for Louisiana style crab boil. Here, long wooden tables are bare. Not a glass, plate, spoon or fork in sight. On the walls are blackboards with market prices of seasonal items. Shining bicycle wheels that turn make an interesting divider for the sink area where deep wooden tubs take the place of clinical porcelain sinks.As soon as we are seated, the waiter tears off a long piece of greaseproof paper and lines the table with it. Then we are offered bibs to put on to protect our clothes. Is it going to get real messy? We’re about to find out. It takes a little while to digest the menu as we can customise our preferences for seafood although one item listed under Making Life Easier has seafood sets (recommended for 2 pax) with choices of meat crab (RM175), French brown crab (RM239) and king crab (RM299). The sets also include mussels, yabbies, scallops, clams, octopus and sides of corn on the cob, potato, long beans, sausage and rice.With over 10 at the table, we order this and a few customised platters too.The menu takes customers step by step in the ordering process. First, we pick the seafood of choice: Type of crab, prawn, yabby, lobster, squid, mussels, scallop, clam etc. Then we pick the sauce: Zesty lemon, garlic butter, jamba-jamba, southern bang and Asian flavours (spicy plum, creamy lemak and Thai sambal). You also get to choose the pedas factor but for the hotter sauces, nicknamed O’ly Crab and Death Valley, there’s an additional RM5 charge. There’s a slight problem here. I love most of the sauces, so it’s hard work deciding which to pick.Step three is picking “bag buddies” such as broccoli (highly recommend for finger lickin’ good creamy lemak sauce), corn, mushroom, sausage, potato, and French bean. That’s it. Once the order is done, it takes 15-20 minutes for the food to arrive.It comes in a big plastic bag that you tip over and pour on the greaseproof paper on the table. Then just dig in. 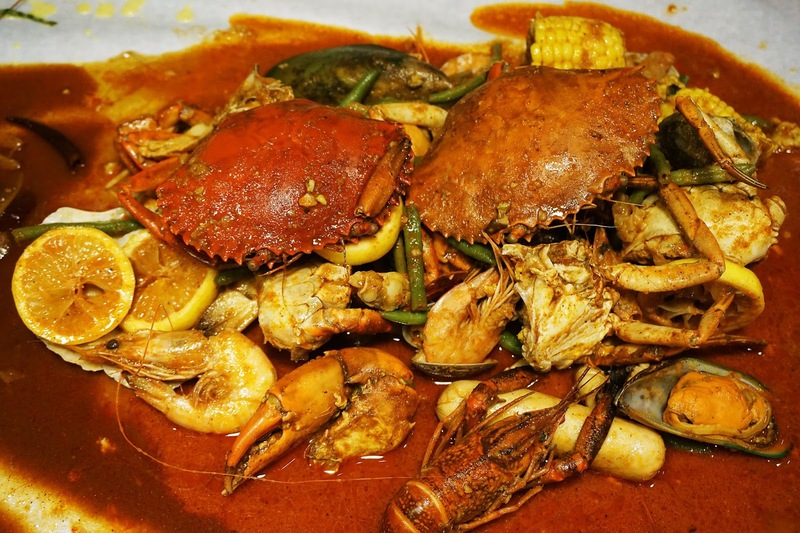 Yes, it can get messy but when everyone is up to their elbows in the sauce, who cares?The crabs are packed with juicy meat and oh, you might want to order deepfried mini buns, garlic bread or a cup of white rice to savour the sauce fully. The Shallot Rice is good enough to eat on its own. Indeed, listed under Something On The Side in the menu are items worth making the trip to Crab Factory for. Apart from the buns and shallot rice, there’s Mushroom Soup and Gumbo (RM12.90), a hearty Southern-style soup with prawn, sausage, ladyfinger and rice. Or try the Fish & Chips (RM25.90), Southern Chicken Waffle (RM27.90), with cornflake coated fried buttermilk chicken served with waffle and maple syrup, and Stuffed Crabs (RM26.90), deepfried stuffed crabs with spicy plum sauce and fries.Deepfried items such as chicken wings, squid tentacles, baby squid, lady fingers, potato wedges and skin-on fries come in two flavours: Garlic and Cajun spice. Crab Factory offers Happy Hour Specials on Tuesday, Wednesday and Thursday (3pm to 5pm) and on Friday, Saturday and Sunday (11am to 5pm) for combos of baby octopus and prawn (RM29), NZ green mussel and prawn (RM35), crab and prawn (RM58) and yabbies’ and prawn (RM39). Each combo bag include corn-on-the-cob, chicken sausage, potato and white rice.